The 2019 event takes place on 28 April, and promises to be another fantastic event! Registration for the 2019 marathon has now closed, and we have our fantastic team of 26 runners plus four guide runners busy training and fundraising. Each year we put on a post-race reception, with refreshments, sports massages and showers available to our runners. It’s always brilliant to chat to our runners afterwards and be a part of their experience and we can’t wait to do the same this year. The London Marathon is a world-famous event, and must-do for all people who enjoy running! It’s a great way of raising money for our cause, while undertaking a fantastic personal challenge. We have some people who run year after year for us, because the buzz of completing after training so hard is unbeatable. If you are lucky enough to get a ballot place and would like to be part of the team, drop us line and we will add you to our great line up! 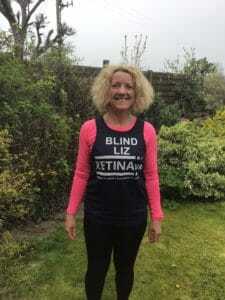 My name is Liz and I am part of the Retina UK Virgin Money London Marathon team this year. 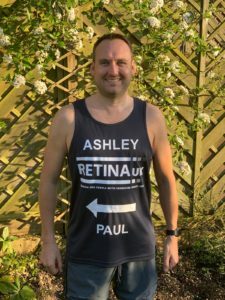 I have retinitis pigmentosa, and when I was first diagnosed I was given very little information from my doctors, which led me to ring the Retina UK helpline. I was given some really good advice, which made me want to give something back to the charity. I have a lovely guide dog called Yves, who is very cheeky and lovable. However for this challenge I will be running with my guide runner Stewart. I love running, cycling and swimming, and have taken part in the Prudential Ride London 100 mile bike ride, the two mile Swim Serpentine, and once I’ve completed the London Marathon I will receive the London Challenge medal for doing all three. I also have a big love of cake which is why I run! You can sponsor Liz by visiting her fundraising page. I’m Ashley, I have RP, and I’m taking on the Virgin Money London Marathon for the third time, having run it previously in 2015 and 2017. I started running in May 2013 to try and keep fit and although I can’t easily run at night or on the roads due to my vision (I use a white cane when walking on my own) I run around the field behind my house and use a running machine in a shed at the bottom of the garden. Since the last Marathon in 2017 my eyes have deteriorated such that my registration has changed from partially sighted to severely sighted / blind with a visual field of no more than 3-5% of a person with ‘normal’ sight. Due to this I have been given a guide runner and am thrilled to say this is one of my closest friends Paul who will keep me running in the right direction. I’m Stewart and I will be guiding Liz at the London Marathon this year. 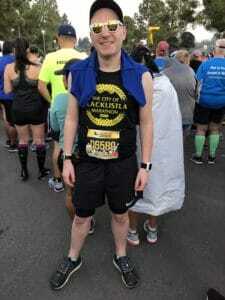 I’ve run eight marathons before, and have just got back from LA having run the marathon over there. I tried for seven years to get ballot entry for the London Marathon but I’ve never been lucky enough to get a place. It’s a privilege to get to run this race that I had longed to do, with someone so inspiring. Much like Liz, my Grandma Rose who is 103 is now blind, so it’s an honour to run for a charity so close to my heart.